Dong Son drum from Sông Đà, Mường Lay, Vietnam. Dong Son II culture. Mid-1st millennium BC. Bronze. The Dong Son culture (named for Đông Sơn, a village in Vietnam) was a Bronze Age culture in ancient Vietnam centred at the Red River Valley of northern Vietnam from 1000 BC until the first century AD. :207 It was the last great culture of Văn Lang and continued well into the period of the Âu Lạc state. Its influence spread to other parts of Southeast Asia, including Maritime Southeast Asia, from about 1000 BC to 1 BC. The Dong Son people, who are also known as Lạc or Lạc Việt, were skilled at cultivating rice, keeping water buffalos and pigs, fishing and sailing in long dugout canoes. 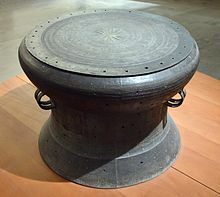 They also were skilled bronze casters, which is evidenced by the Dong Son drum found widely throughout northern Vietnam and South China. To the south of the Dong Son culture was the Sa Huỳnh culture of the proto-Chams. ^ Nola Cooke, Tana Li, James Anderson - The Tongking Gulf Through History - Page 46 2011 -"Nishimura actually suggested the Đông Sơn phase belonged in the late metal age, and some other Japanese scholars argued that, contrary to the conventional belief that the Han invasion ended Đông Sơn culture, Đông Sơn artifacts, ..."
^ Taylor, Keith W. (1991). The Birth of Vietnam. University of California Press. p. 313. ISBN 0-520-07417-3.